Openreach is inviting its telco customers to participate in a consultation that will identify the best way to migrate the UK from copper to fibre infrastructure, with a view to switching off the analogue network entirely. BT-owned Openreach is embarking on a major build of FTTP, with ambitions to reach 10 million premises by the middle of the next decade. It has pledged to expand the scope of this rollout if the investment conditions are right. It believes engaging with industry is a key enabler to delivering this larger target and to fulfilling the government’s ambition of a nationwide FTTP network by 2033. The consultation is seeking views on how Openreach would build out this new network, how the industry should migrate customers across, and how Openreach should eventually retire the copper network. For its part, Openreach has outlined a number of principles to guide the process. These include a pledge to avoid building new notspots, to work with customers to upgrade every customer in areas where the network is available and a simple product portfolio. It believes copper services should be phased out progressively and that large numbers of customers should be upgraded “voluntarily”. Openreach is also proposing a consumer charter to encourage transparency and create a process for those who will be migrated at a later date. “More than 16 million homes and businesses could order better broadband connections over our network right now, so we’d encourage everyone to check the services available to them and upgrade today,” said Katie Milligan, Managing Director for Customer, Commercial and Propositions at Openreach. “At the same time, we’re consulting with broadband providers to decide how and when we upgrade customers to even faster, more reliable and future-proof, full fibre broadband. “Our new network will place the UK at the forefront of the global digital race and provide a major boost to the UK economy, so we’re determined to create a plan that will benefit of every UK community, by upgrading customers quickly, smoothly and affordably. 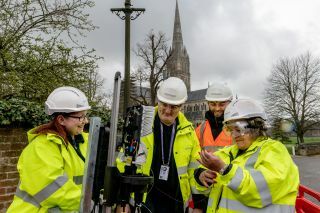 Openreach’s short term target is to connect three million homes and businesses by 2020 and recently announced Salisbury would be the first city in the UK to have universal access to the FTTP network. The government’s Future Telecoms Infrastructure Review (FTIR) has called for 15 million properties to be covered with fibre by 2025 and for nationwide coverage to be completed by 2033. It would then consider switching off the UK’s copper network. However, the Institute of Directors (IoD) believes a more ambitious timetable of 2025 would encourage fibre adoption and rollout.